The Japanese Chin temperament is self-confident and intelligent. 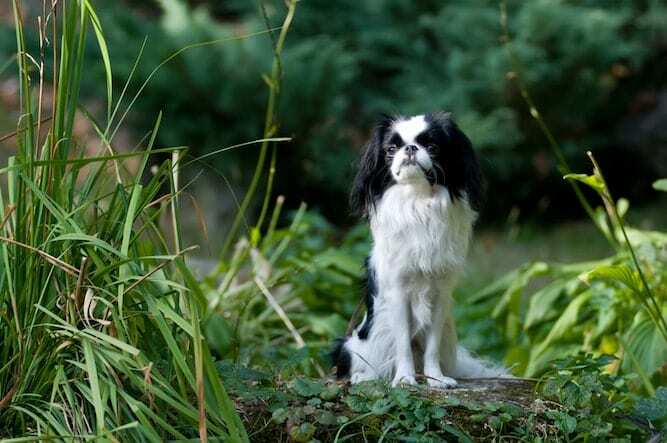 The Japanese Chin's origin is Asian and dates back more than 1,500 years. It was the product of the Chinese imperial court. Highly prized, Japanese Chins – known as “Chins” – were often given as gifts to nobles or high-ranking emissaries. Chin’s were particularly desirable in Japan. They were not regarded as dogs (or ‘inu’) but rather ‘chin’ – their own distinct entity. Japan is where the Japanese Chin developed their distinct look after they were crossed with a Continental Toy Spaniel (later known as Papillons). If you’re looking for a small dog with a big personality, the Japanese Chin is the breed for you. Not only do they have a big personality, but they also have a fantastic sense of humor. Chin’s have a reputation for continually making their owners laugh. You’ll never know what’s in store when it comes to a Japanese Chin. The Japanese Chin dog has a wayward temperament and tends to pursue their interests. With a healthy dose of self-confidence, the Japanese Chin behaves as though it is aware of its royal origins. Japanese Chin dogs will choose who they will and won’t like. They will sulk when they don’t get their way and be careful if you anger them – Chin’s have an excellent memory. You certainly don’t need a television with a Japanese Chin around. Though they put on a pleasant and polite front, they are clowns at heart and love mischief. The Japanese Chin loves to do things they aren’t supposed to do to see your reaction. In addition to their clownish behavior, Japanese Chins love to put on a show – even singing, dancing, or talking. Some have described their voices as “little killer bees.” But if you don’t praise them, they’ll never do it again. Chin’s are generally quiet dogs, though – only known for their “singing” with humans or another Chin. Aside from their antics, they are brilliant. Japanese Chin’s are homebodies and love to be around their humans. They tend to suffer from separation anxiety when away from their owners for too long. Because of their small size, Japanese Chin’s do well in apartments and can adapt to any living situation. Japanese Chin’s are generally pleasant dogs and get along well with everyone. They are friendly with other dogs and cats. And, they make an excellent companion for older children. Due to their small size, this breed doesn’t do well with young children as they could accidentally get injured. They can be a bit shy around new people and situations, though. Japanese Chin’s are very sensitive dogs. They can pick up on emotions of their owners and the environment and shape their personality to match. For example, if a Chin lives in a quiet home, they will be reserved and quiet. If they are in an active home, they are outgoing and lively. Japanese Chin’s frequently display catlike behaviors, and it can show during training. 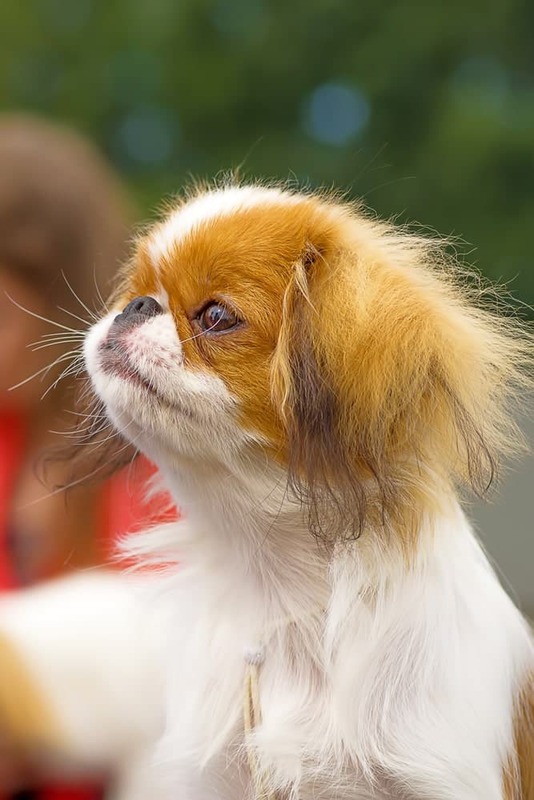 Though extremely intelligent, the Japanese Chin is picky when it comes to training. But you can successfully train them – if they like you. When your Japanese Chin respects you, training should be a breeze. Correct them with a firm (not harsh) tone and never use punishment. Harsh training methods do not work with Chin’s – especially since they have an impeccable memory. To avoid an untrained Japanese Chin, keep training sessions short, fun, and full of positive reinforcement. If reading about the Japanese Chin’s personality convinced you to add one to your family, now it’s time to decide how. Do you want to purchase a Japanese Chin from a breeder or adopt one from a rescue? A Japanese Chin for sale will cost you around $1,100. But, you can expect to pay between $1,900 and $6,100 for top quality Japanese Chin puppies. Japanese Chin puppies with breeding rights and papers will cost you more than those without a superior pedigree. There are several Japanese Chin rescues if you an interest in adoption. When you adopt a Japanese Chin from a rescue, you have the option of adopting an older Chin, a Japanese Chin puppy, or a Japanese Chin mix. 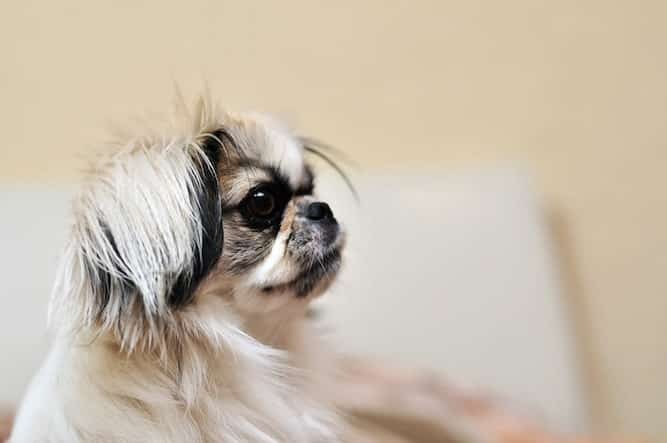 Adoption is an excellent choice for those who want to add a Japanese Chin to their family but may not have the budget for a purebred, show quality Chin. It is also great for those looking for an adult Japanese Chin. Luv a Chin Rescue and Japanese Chin Care and Rescue Effort are two resources for Japanese Chin adoption. 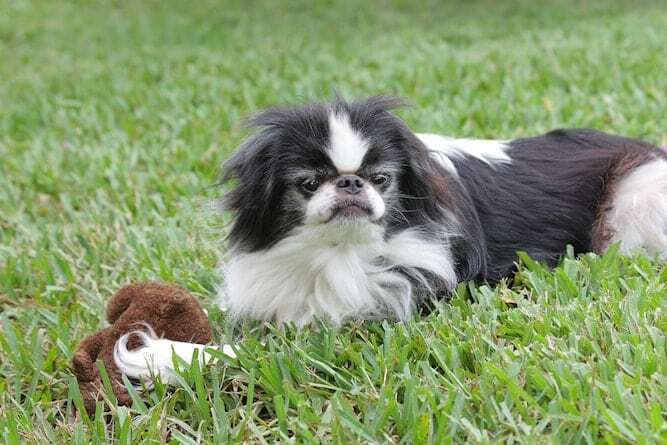 To find Japanese Chin breeders in your area, try the AKC Marketplace for Japanese Chins. There, you will find information on breeders by location and by quality. When choosing a breeder, find one that is reputable but also knowledgeable about the breed. Ask them questions to make sure the Japanese Chin is the right breed for your family. Japanese Chin’s have a regal look. They have a large, broad head with wide-eyes and a flat-like face. The average Japanese Chin weighs around 4-7 pounds and is about 8-11 inches tall. Though they appear to be high maintenance, the Japanese Chin’s coat is quite easy to maintain. Japanese Chin grooming requires only weekly brushing and a bath once per month. Their nails grow quickly and so don't forget to trim them regularly. And, because they have floppy ears, their ears should be checked regularly for wax buildup and debris. The Japanese Chin is generally healthy, but like all dog breeds, they can suffer from specific health conditions. To be on the safe side and help keep your Chin on the healthy side its good to have a Good Dog Health Guide on hand. Though small, the Japanese Chin is an active dog. They love to go on walks with their owners or roam around a (fenced) backyard. Ensure your backyard is fenced as the as the Chin is known for their ability to jump and reach high places. Some Japanese Chins have been known to jump six feet! For those looking for a tiny dog with a huge personality, the Japanese Chin is perfect. Born for royalty, they have a great sense of humor and will never fail to put on a show for their humans. Japanese Chins do well with other pets and adult children, only requiring a moderate amount of exercise and minimal grooming. Adding a Japanese Chin to your family will keep you on your toes – there will never be a dull moment with this breed around! Previous post: Are You Ready For The Affenpinscher Temperament?